What if we told you that you can pass your Real Estate Exam on your 1st try without even opening your Real Estate text book! Well, the truth is, you can! Review this complete simulated Real Estate Exam and pass with minimal effort! Learn and study from the best set of questions and answers available for the current Real Estate Exams. We have the questions and answers you need! Our exam simulations contain more than 1,500 Real Estate Salesperson and Brokers Exam questions and answers for your state exam. You will have access to all the questions and answers that are currently used to study for the Real Estate Exams for your State! Our Online Interactive Question & Answer Exam Simulation is complete with explanations for the answers and scoring. Our exam study program is designed to help you pass the Real Estate License Exam with flying colors and on the first try! Instant Access! 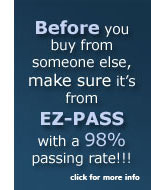 Your Interactive EZ-Pass Real Estate Exam Prep. will be made available to you right after payment is made. Click HERE for FREE Real Estate Class! out there! It is worth the money and much more! AWESOME learning material!! Thanks Again!"